Been a while since I've actually gone out and done some light painting. I had replaced the incandescent bulb in my 4D Maglite flashlight with a 160 lumen LED light. Better on power consumption, brighter, and whiter. I decided that the weather was getting nicer and I've been itching to go out to shoot something with this technique. The technique is very simple really. First is to find a subject you want to illuminate in a very dark scene. Think about the background you're going to expose, and then consider the angle that you're going to shoot your light. It's pretty much near impossible to do this with anything less but bulb mode, a tripod and a remote of some sort. Once you find your subject, you'll need to shine the flashlight on your subject and focus onto that. Then dial in your aperture and open the exposure on the first press. During that time you're going to shine the light on your object and slowly pan the beam of light across the object. 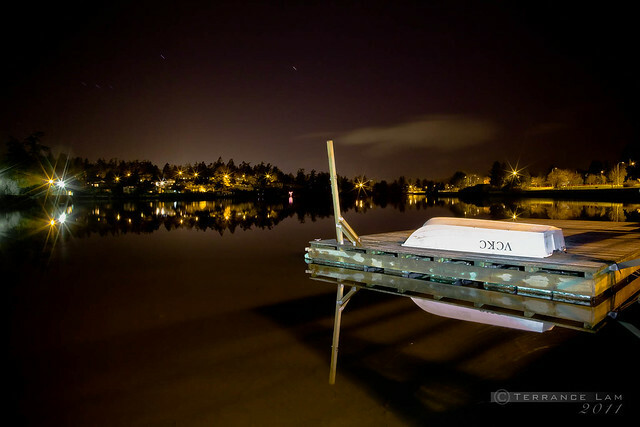 In my case I started with boat and in fact the back portion of the boat was shaded by streetlight and the pier's fence. As I slowly pan, I try to keep my beam of light ahead of my camera but not in the view of the camera to avoid casting a shadow of my equipment. I actually move from side to side to essentially reduce any shadow to give away my position. In this shot it took two minutes of exposure. I painted across the the subject from bottom to top, along the post and back down to the boat. The reflection is generated from my light painting as well so don't shine the light into the water.